Its 10th of the month and time for yet another Mfb challenge now this is” a better late than never” moment! I totally gave it up, as I thought tomorrow is 10th and I prepared it today. But after seeing Rafeeda’s post I realized it oh no it’s 10th today hehe! Preparing, clicking editing everything in a day is not an easy task with all other homely stuff to do! As Rafeeda said still there is time to post I thought why not to give it a try, as it’s a simple one! So while teaching Kashif I’m doing this. 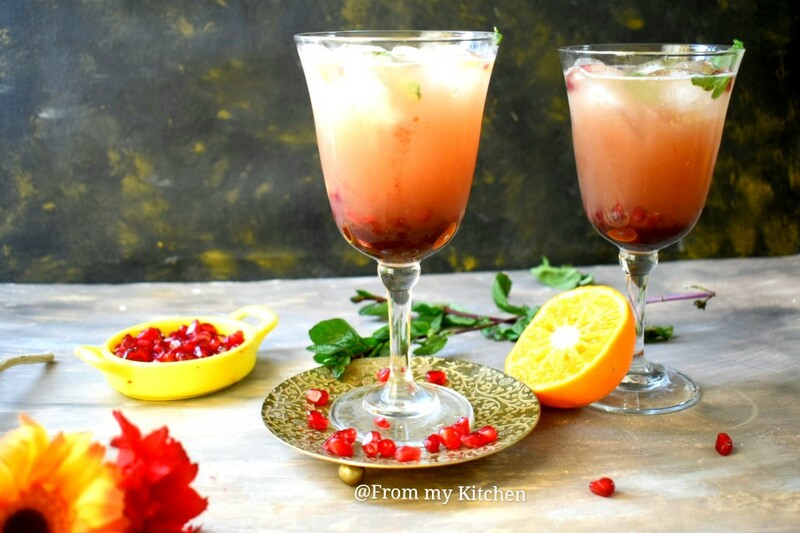 This pomegranate fizz is a refreshing thirst quencher with some fresh flavors in it. 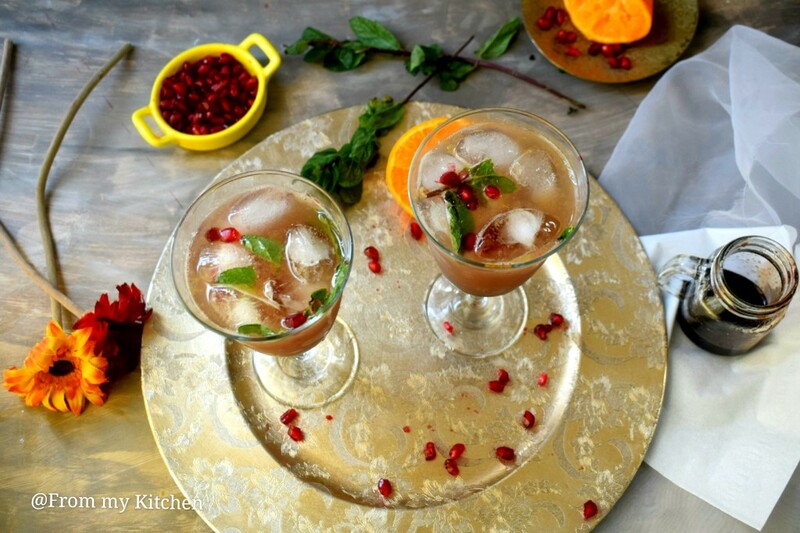 The combination of pomegranate, fresh orange, lemon mint with fizzy soda is to die for. Look at that color! Here you need to blend together sugar, pome some lemon juice and ginger first and then simmer it to make a syrupy consistency. If you are out of time just blend it all strain and then assemble it. I tried both ways the simpler one is more delicious than simmering and all. In a tall glass pour some of the pome juice pile it up with ice squeeze some orange juice some more and seven up or soda. 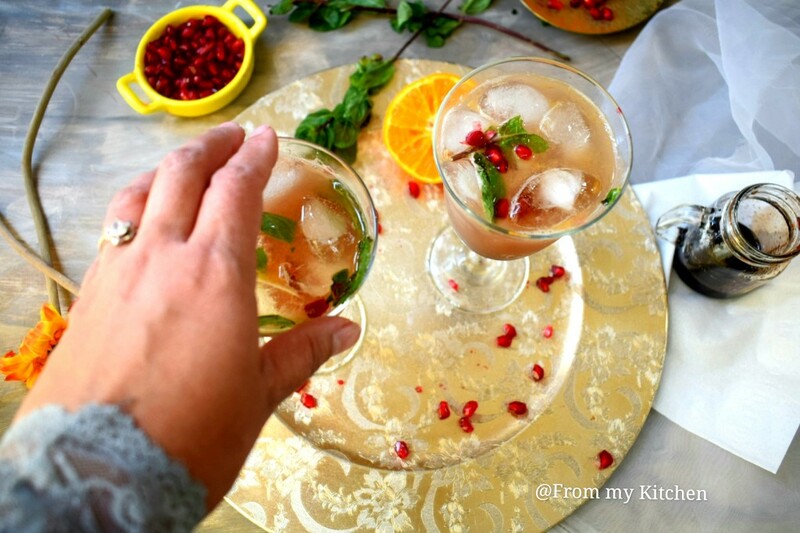 Add fresh mint and pomegranate seeds and dive in. 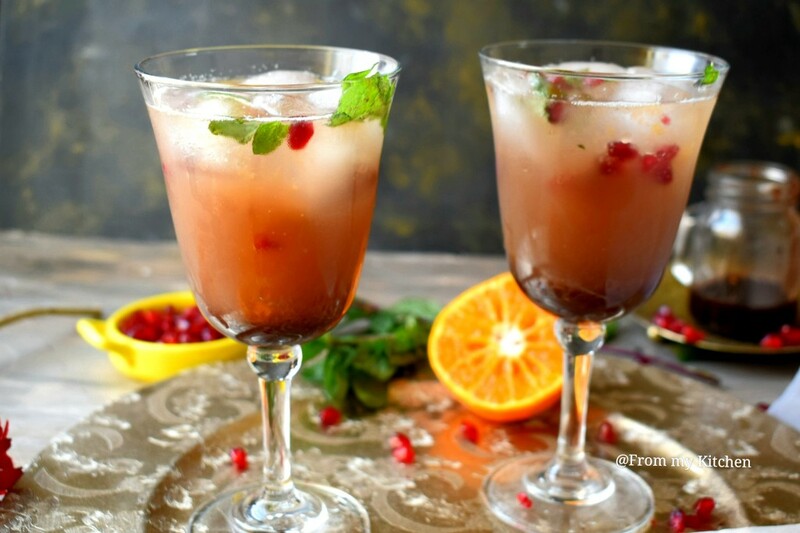 Refreshing pomegranate fizz will boost your energy level! Believe it or not, this was one idea I had to do with pomegranate for this month’s challenge but I somehow never got to make it. Looks so refreshing! 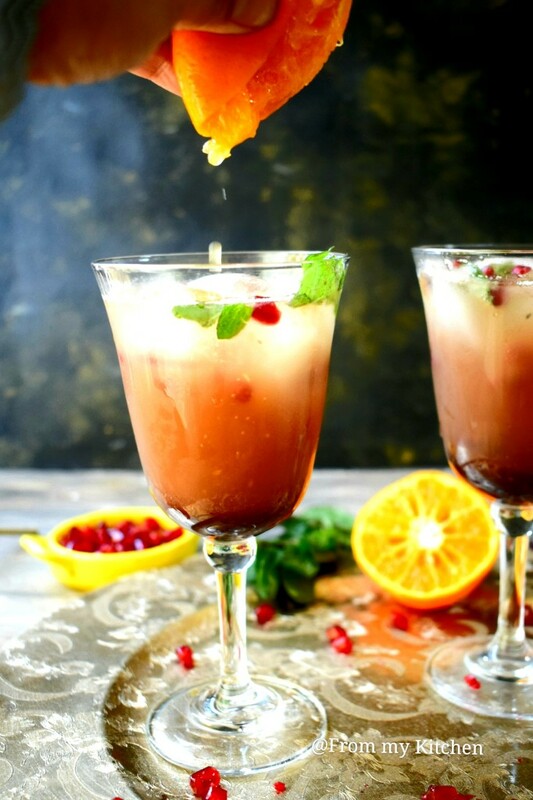 Your pomegranate fizz looks stunning! A healthy alternative to cool drinks out there! Feels like wanna grab one glass right away!! That looks soo refreshing and amazing click too!! Congratulations for pulling off all of this in one day! 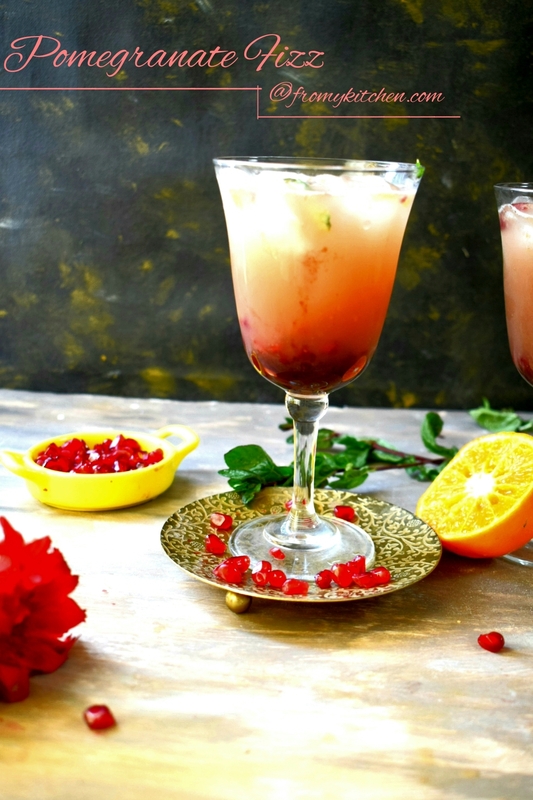 I’m really intrigued by this drink, and hope to try my own spin on it soon inshAllah! 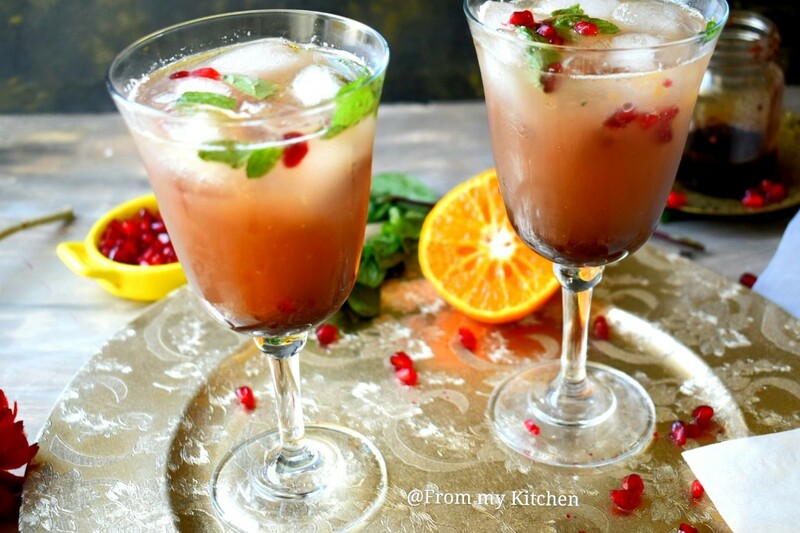 I am fan of fizzy drinks and this looks absolutely yum….